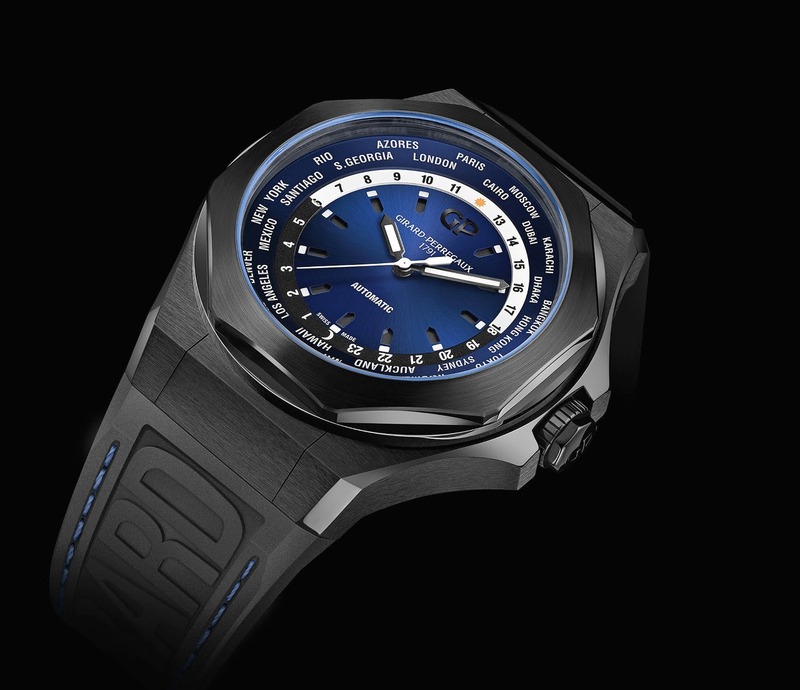 Girard Perregaux - SIHH 2019: Girard Perregaux Laureato Absolute WW TC. 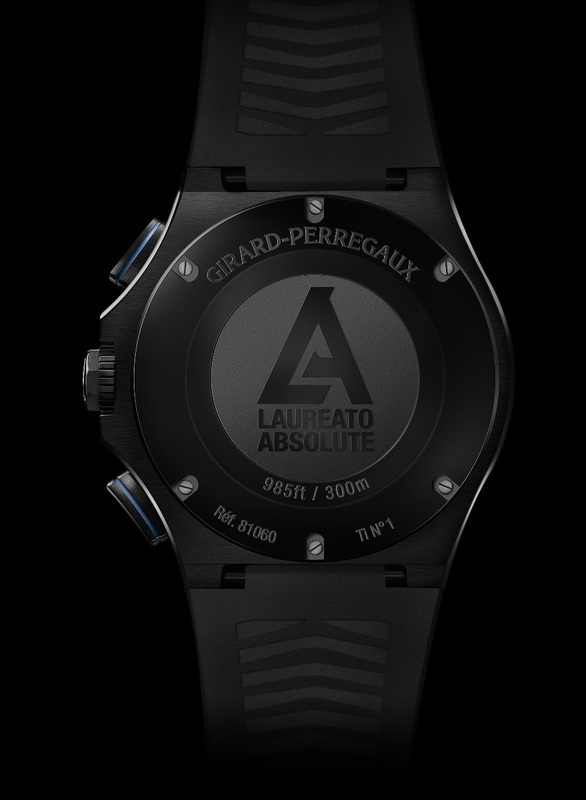 This year, Girard Perregaux comes with three new Laureato called Absolute, the Time Only, the Chronograph and the WW TC. The idea behind the word " Absolute " is making a more powerful Laureato. A bigger case, which is 44 mm, now, made in PVD coated titanium, for a stronger look and a bigger presence, an enhanced water resistance, which is 300 meters, now, a blue turning to black sunburst finished dial, and, cherry on the cake, a blue seal surrounding the sapphire glass. 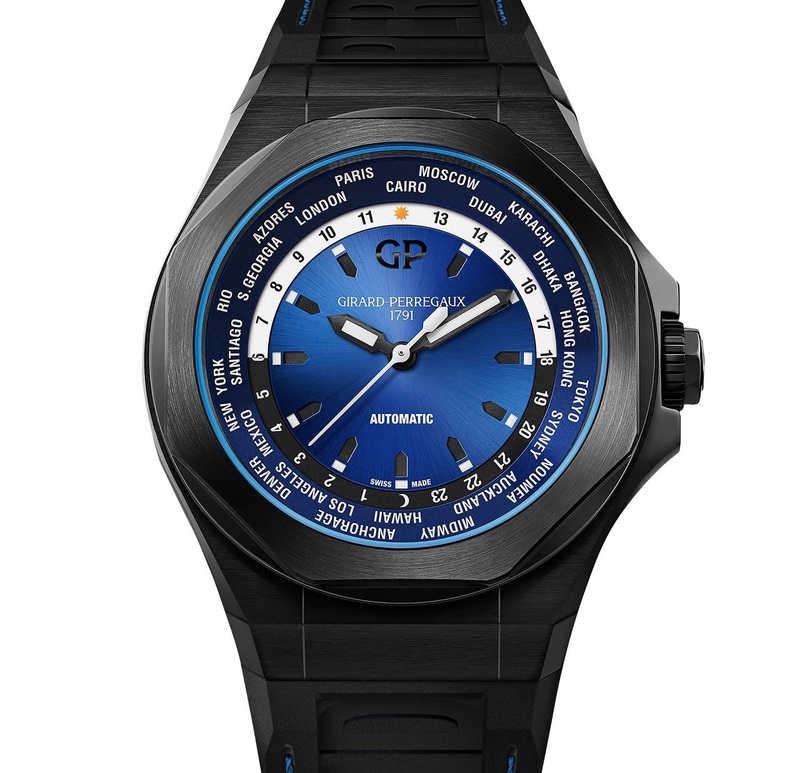 Add a curious integrated rubber strap with a blue stitching, signed Girard at 6 o' clock and Perregaux at 12 o' clock. These are the aesthetics shared by these three models. Offering a world time complication to the Laureato is an excellent idea, I must say. The decoration of the dial, with partial sandwich indices, is interesting, but the automatic mention was not mandatory, and the font is too big, too. What I really love is the blue seal around the glass. That's a captivating detail. Now, the watch is big, and it is a black watch. It will not be a consensual watch, for sure. I don't have the thickness of this Laureato but when you see it in the real, it is really bold. One word about the movement, it is the well known in house Cal GP 3300. Small ( 26 mm ) automatic, and offering a power reserve of 46 hours, it is protected / hidden by a solid case back ( here, the one of the Chronograph ). I have a mixed feelings, Nicolas.